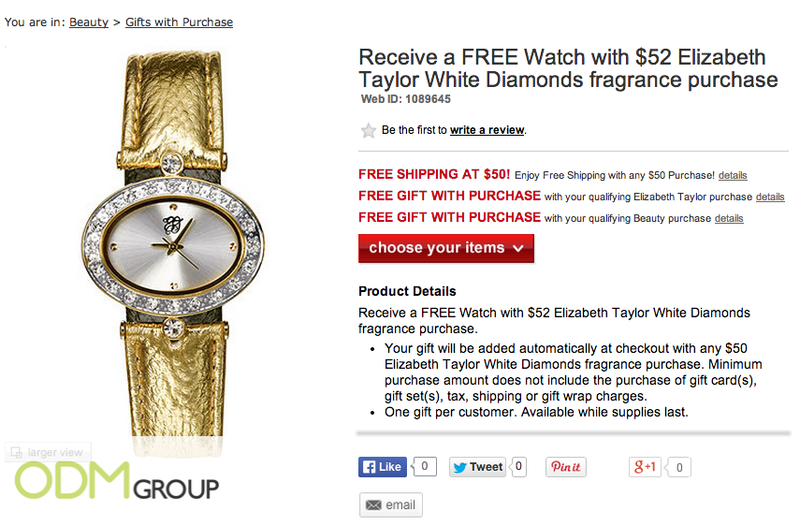 Receive a free custom watch from Elizabeth Arden with purchase of the Elizabeth Taylor White Diamonds fragrance. This watch will be automatically added to your cart when you buy the fragrance. This deal is a Macy’s exclusive so do head down to their website to get your hands on the watch now! Elizabeth Arden Inc. is a cosmetics company founded by Elizabeth Arden in 1910. The company continues to offer color coordinated make-up sets and an extensive line of skin care treatments and products. Attract customers by offering a custom watch as a promotional gift! Watches are extremely attractive promotional gifts because they are perceived to be of great value. The custom watch comes in gold and is decorated with diamantes round the face of the watch. This watch looks elegant and timeless; it definitely is a gift that your customers will love to receive. Some customers may be attracted by this gift item and end up purchasing your products in order to obtain it! 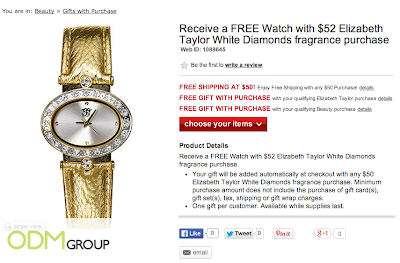 Thus by utilizing a customized watch like Elizabeth Arden, you will be able to get more customers. It also helps to portray a positive brand image and leaves a long lasting impression on your clients! Even though the customized watch looks expensive, they are actually quite cost effective to produce! When you produce a large quantity of it, you will be able to experience economies of scale! Thus this is a form of investment that pays for itself because the small amount of money you spend for the watches will generate a large number of sales!